- Expert duelist and marksman. Can quickdraw a rifle faster than most can quickdraw a pistol. - Her father gave her full control of his army for her 18th birthday to which she uses to compete for the Crown of Dominion. - She is an honorable warrior, treating her adversaries with respect as long as they respect her. - Extremely sore loser. She is not used to failure and doesn't know how to cope with it. - Completely blind to romance. Romance is not a part of her culture, and is not interested in any suitors that may attempt to try and marry her. - She dislikes magic and considers it a dishonorable and cowardly way to fight. - She is afraid of water (because it tends to ruin the gunpowder) and thus cannot swim. -Bullet Princess comics generally do not take place in Void City. In Void city canon, Bullet Princess is a TV Show. - The crown of dominion appears once every 100 years to select a princess worthy of it. No one is entirely sure what it grants but rumors and folktales surmise that it grants anything from immortality to endless riches. - The Kingdom of Winchester is a militant kingdom that thrives on war. They are constantly invading other kingdoms for either profit, or just to see if they can. The army primarily consists of riflemen, and are the only kingdom on the continent that have invented firearms. - The men and women of winchester train like spartans to join the army. Anyone born with any sort of sight deficiency serves as armorers and gunsmiths. 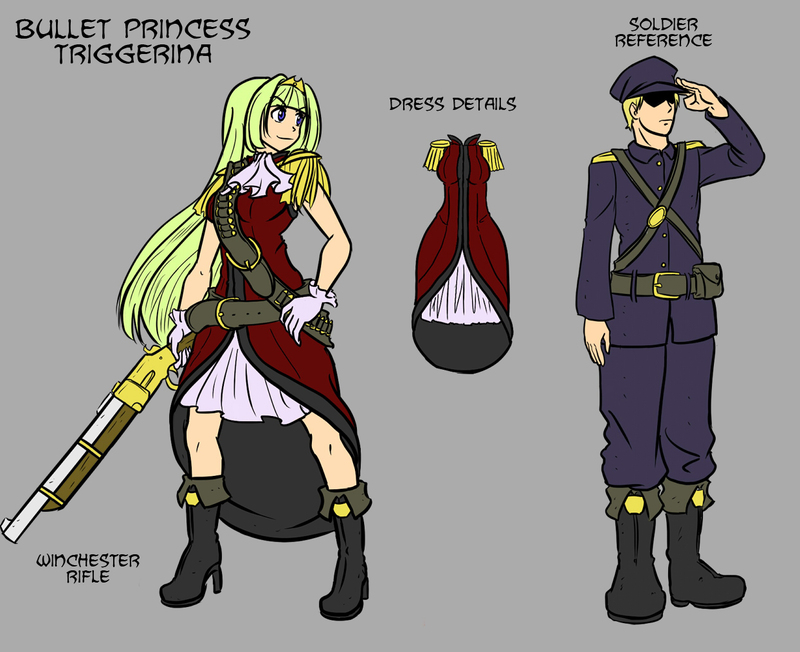 - The Royal Family of Winchester consists of the Gun King Magnum, Gatling Queen Munitia (deceased), Bullet Princess Triggerina, and Prince Ordnace. Paracelsus - A poor Kingdom that has recently stabilized it's economy through it's breakthrough of Alchemy. Ruled by Midnight Princess Zezolla. Gatis Ilands - A popular hideout for pirates. Frequented by Ocean Princess Sirenetta. Edelweiss - A former dwarf kingdom that lays in ruins on top of a snowy mountain range. This is the Domain of the White Princess Myrcina. Wonderland - The trade captial, it's the richest kingdom on the continent. Owned by the Princess of Hearts Alice. Lotus Empire - An oriental Kingdom that has been around for generations. It holds the largest population among all other kingdoms. Lead by Dynasty Princess Magnolia. The Jungle - a vast jungle known to house nearly every monster known to man. The monsters have taken refuge here due to the war. Ruled by Beast Princess Beleza. Verona - The Artisan's town that has recently been seiged by a demon cult lead by Calamity Princess Juliet.